Paris on the banks of the Seine stretches from Saint-Chapelle and the Notre Dame in the east to the Eiffel Tower in the west. 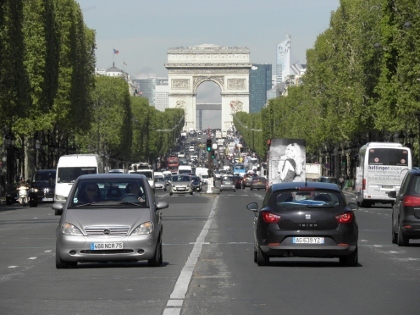 Along this kilometers long route one can find many of the main treasures of the French capital. 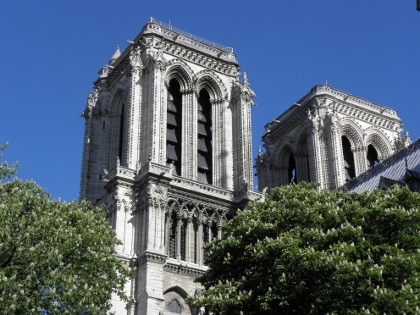 The Notre Dame is one of the eldest monuments: it's construction dates from the 12th century. Nearby Saint-Chapelle has the same age. Both are on the Ile de la Cité. This little island is linked with the rest of the city via many bridges, of which the Pont Neuf is the most famous. In the middle of the route there are the two major museums: the Louvre and the Gare d'Orsay (a former train station). This is also the part where the spacious Place de la Concorde and the Egyptian Obelisk are situated. The Eiffel Tower is at the end of the route. 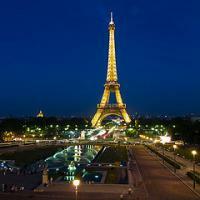 Built for the 1897 world fair, it still stands strong as the number one symbol for Paris. I started my first visit to Paris at the Notre Dame Cathedral. A real surprise when you pop your head up from underground, having used the subway to get to de Ile de la Cité. So this is Paris. I think I'm going to like it here! To enter nearby Saint-Chapelle I had to queue for about 20 minutes. It's a lovely small chapel, but if it's worth the EUR 5,49 entrance fee and all the waiting? In the afternoon I took a boat trip on the Seine. In the timespan of an hour you get to see several of the city's highlights from the water, for example the Pont Neuf, Gare d'Orsay and the Eiffel Tower. It was a cold experience (sitting on deck while it's nearly freezing), but not too be missed. Ten years later, I was back in Paris for a second visit. I had some more time to spend: on Saturday I enjoyed two museums (d'Orsay and Guimet), and on Monday I walked the whole WHS-designated stretch along the Banks of the Seine. It took me 3.5 hours, without getting inside any of the landmark sights I came across. I enjoyed it tremendously: around every corner there's something pretty or remarkable to see. I saw so many equestrian statues that I think a whole book could be written about them. I had a glimpse into the Grand Palais through an open side door, what an amazing iron/steel/glass construction. I have to come back and visit it properly. And I still haven't visited the Louvre yet. There is no perfect way do determine the exact boundaries of a city WHS. And while there are cities like Quito that seem to have no boundaries at all or like Samarkand that include huge and also some less interesting parts of a city. On the other hand there is at least one city on the list with absurdly narrow boundaries: Paris. I think even most WH travellers are unaware how little of the centre of Paris is included into the core zone while a buffer zone doesn’t even seem to exist. It includes naturally the most iconic sites like the Ile de la Cité, the Eiffel Tower and the Louvre and seems beyond that mainly interested in the buildings from the world exhibitions: the Trocadero and the Palais de Tokyo. Both of them are not very attractive if you view them closely and in a surprisingly bad state. On the other hand it excludes several iconic sights that border directly the current core zone. Among them the Champs-Elysées, the Palais Royal, the Chatelet and the magnificent St. Julien le Pauvre. It also excludes many of the unique sites just a block or two further away from the Seine: The Palais Garnier, possible the most fairy tale theatre in the world, the Arc de Triomphe, St. Eustache, the Place des Vosges, the Jardin de Luxembourg, the Pantheon, Saint-Germain-des-Prés, the oldest church of Paris. It doesn’t either include the old quarters that escaped the Hausmannian changes of the city like the Marais and the Quartier Latin. It would be an easy extension to include all these sites who are part of the very historic core of the city by extending the borders just a few blocks. I am sure nobody would even discuss if this were legitimate. Beyond this the current WHS does neither include some famous site which are a little further away from the Seine like the Montmartre area with the iconic Sacré Coeur or the Cathedral St. Denis with its magnificent royal tombs. Those two should be easy extensions as well or even independent WHS if the city and the country took a real interest in promoting them. My impression is that nobody cares because Paris is already famous and full of tourists and therefore it is unlikely anything will ever change here. The fact remains that this is possibly the most understated core zone on the entire list. Perhaps the most surprising thing about the Paris, Banks of the Seine World Heritage Site, one of the most famous and visited sites in the world, is that 16 French World Heritage Sites were inscribed in previous years before it was finally added to the list in 1991. Paris is easily one of the most picturesque cities I have ever seen, with amazing views from the heights of Notre-Dame, the Eiffel Tower, and Montmartre (of which the last is not part of the inscribed site), as well as at street level, with grand boulevards and squares. Even the underground sewer system (so thoroughly described by Hugo in Les Misérables) and catacombs are tourist attractions, though I believe the official site boundary stops at surface level. 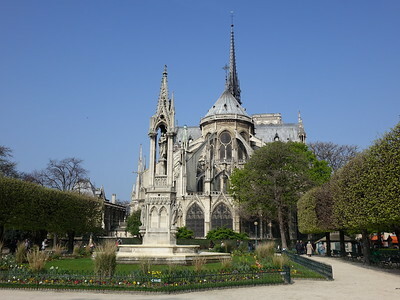 Of the inscribed properties in this site, I particularly appreciated Sainte-Chapelle, with its beautiful stained glass which glows in morning light, and the Musée d'Orsay, with its impressionist and post-impressionist art displayed throughout a former train station. As alluded to in previous reviews, the Seine is the heart of Paris, and a walk or a boat ride along it, at any time of day, is highly recommended, and one of the best ways to appreciate the feel of this world-class city. Logistics: Walk along the banks. Take a tour boat, or, if you prefer a cheaper, non-narrated option, buy a pass for the Batobus river boat shuttle. Explore, but take time to relax and enjoy this beautiful city. The most visited site by our community. I was back in Paris for some personal business in mid-Januaruy 2017. When I looked at the map of the core zone of this WHS again, I noticed that some areas of the core zone are off the Seine. 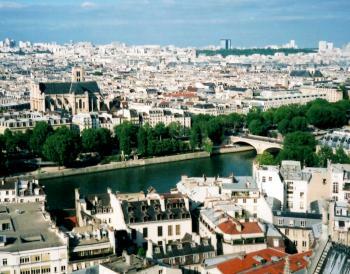 Such areas include the Madeleine and the park where Eifel Tower is situated. I was also happy to see the Tomb of Napoleon, my man, in the core zone. There are many tombs around the world that are World Heritage Sites, and Napoleon's should be one of them, even though it may be a relatively recent one. Paris, the No. 1 on the list of most visited WHS on this website and truly a wonderful city. And it is one of those WHS that I have visited most frequently. At the end of the 1990s and early 2000s, I had an annual scientific meeting in Paris in late March, a perfect opportunity to extend a business meeting to a long weekend trip. Moreover, I visited Paris twice on private trips, most recently in September 2015 at the end of our tour to northern France. So I had plenty of opportunities to visit all the major tourist sights over the years. 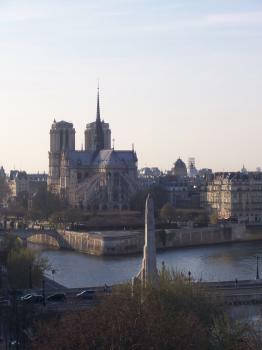 All the monuments and museums along the banks of the Seine are well known, well described and - crowded. So, just a few comments. 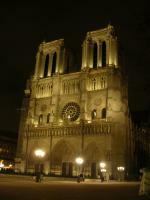 Notre Dame - A perfect starting point to explore the city and to get a feel for the crowds of tourists. Ile de la Cité is the oldest part of the city and somehow still its centre. The Towers of Notre Dame - Long queues. Climbing church towers is very often not worth the effort, mostly the views are less exciting than expected. So it is with Notre Dame. 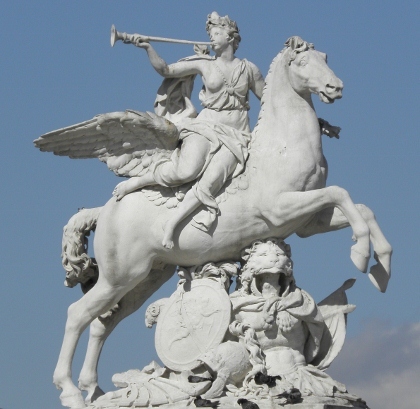 But it is so popular because you can have a close look at the quirky statues that watch over Paris (photo). By the way: You have the best view over Paris from the top of Arc de Triomphe: unobstructed views in all directions. Or for free from the roofs of the department stores Galeries Lafayette or Printemps. Sainte Chapelle - Long queues. A nice Gothic chapel, but overrated in my opinion. The Louvre - I could spend a whole week in there, absolutely great, often considered the best museum in the world and I would not contradict. Mona Lisa - clearly overrated, there are better paintings by Leonardo just in the next room. You cannot view it well because of the barrier and the crowds, but go there, you can take nice pictures of people taking pictures of the Mona Lisa. The Tuileries - On a sunny day, try to grab one of the chairs around the basin, eat a baguette, enjoy the sun and watch the tourists. Musée d’Orsay - Another world class museum in a wonderful location. But if you have a fondness for Expressionism, visit the Musée de l’Orangerie, the Water Lilies paintings by Monet are marvellous. Grand Palais - A masterpiece of steel and glass. Built for the Worlds’s Fair of 1900, only open for special events. I visited the Grand Palais many years ago, I can not remember the exhibition, the construction was much more impressive. Tomb of Napoleon - Kitschy and nationalistic, would not visit again. Eiffel Tower - I had exactly the same thoughts and feelings as Ian describes in his review below. If you see it, you will like it, an impressive construction. I was never at the top level, you will have to book well in advance. But I climbed twice the stairs to the second level, once at night (open until 11 pm), a very special atmosphere. If you like to visit several museums and monuments, a museum pass may be an option (available for 2, 4 or 6 consecutive days). You get free entry to a long list of sites in and around Paris as often as you wish, without queuing. 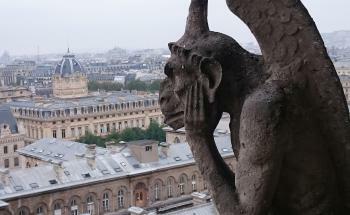 But be aware, that there is no privileged access to the Towers of Notre Dame and the Sainte Chapelle. For the Louvre, you can also preorder tickets online, nevertheless you should come early because there is also a queue for prebooked tickets. I visited Paris in 2007, and at that time I only had a vague notion of UNESCO. Therefore, when I wandered Paris it certainly was not UNESCO themed, but instead focused on some of the icons of France. I spent considerable time at Notre Dame, the Eiffel Tower, and the Louvre. Luckily, I also unintentionally visited a few other sections of the inscribed area. I only have positive memories of my time in Paris, indeed many of the stereotypes I'd heard about France and Paris were far from my mind as I enjoyed this beautiful city. There are so many historical and cultural sights in Paris that it surely must have made more sense to include them all in one WHS. From the Notre Dame Cathedral to Montmartre, from the Louvre to the Eiffel Tower, from Place de la Concorde to the Opera Garnier. Paris and the Banks of the Seine offer a new discovery and a new experience every time I visit. Old and new intertwine in a perfect symbiosis and offer one of the richest experiences you can get when visiting a WHS. just came back .. Notre Dame is a real eye opener how did they buil it?? also the spire on St Chappelle is a feat of architecture. and the footbridge next to point neuf is worth a visit on friday night if you like to socialise..bring your own wine!! From the time I was 8, I had read so much about Paris that it became the number 1 place I wanted to visit. I got my wish at 14 and the first time I saw the Eiffel Tower, it took my breath away. My parents, my sister, and I all purchased Sorbonne sweatshirts and we all wore them for a family photo in front of the Eiffel Tower (so cheesy, I know, but it was a proud moment for me then)! I remember taking the boat tour on the River Seine and just taking in the sites. I'd love to visit again as an adult but then again, there are 800 other WHS to see! I have now visited Paris twice and almost by accident I have indulged in two clichés, the first time I visited I stumbled in on Bastille Day and was treated to an amazing firework display whilst standing on the banks of the Seine. 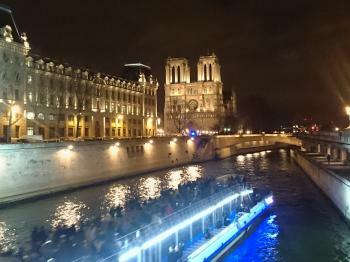 The second time I took my girlfriend there for Valentines Day and had the most fantastic time strolling along the river from Notre Dame to the Eiffel Tower. There is so much to do that I would have no problems having another trip here. There are many points of interest along the river banks, and it is two of Paris most famous sights that captivated me most, it can some times be disappointing to see ‘world class’ attractions however the Eiffel Tower and Musée du Louvre were just enchanting. Having now visited many of the great grand museums of the Western World (Pergamon, British, Smithsonian etc.) 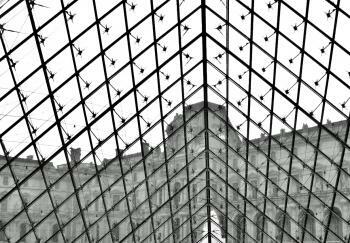 I feel that the Louvre has the distinction of, in my humble opinion, being the best of the bunch. The exhibits are world class and the way they are displayed is sensational, it manages to combine both a classical Palace setting with fine contemporary architecture and in a way that is hard to beat, and I only see about a 5th of the collection. However the highlight of the city for me has to be the Eiffel Tower, I wanted to not like it, I wanted to be unimpressed but I just couldn’t, it is massive and an exceptional feat of engineering worth of being one of the worlds most famous sights. This is added to by a great architectural heritage, it is one of the great cities for art nouveau (iif you are a fan it is well worth hunting out the house at No. 29 Avanue Rapp near the Eiffel tower! ), there are exceptional modern buildings, especially Institut du Monde Arabe, and the plasticy wedding cake like concoction that is Sacré Cour. Added to this are great cafes and restaurants (Quartier Latin and Montmatre) and heaps of other sites too numerous to list, including the exceptionally ugly UNESCO headquarters. Paris is a world class city that deserves a weekend of any ones time. Paris, the Banks of the Seine? When I made a three days trip to Paris with friends we did lots of sight-seeing there, including many of the famous buildings, such as the Eiffel Tower, Notre Dame Cathedral, Sacre Coeur, Arc de Triomphe and many more, but the best thing we did there was to take a boat trip on the Seine in the evening. It's such a wonderful moment to see the Eiffe Tower by night, shining because of all the small lamps on it. Paris in general is always worth a visit, but besides all the lovely touristy places you soon will see that those great places always are very close to poverty/poor people who suffer while tourists spend 3 Euro for a glass of coke. It is very appropriate that Paris´ World Heritage area is called "Banks of the Seine", because few cities are so defined by the river flowing through it as Paris is (none, I would say). Almost all the major sights are located on or close to the river, and there is no better way (who cares if it´s touristy and kitschy?) to enjoy Paris than by taking a river cruise in a bateau-mouche. Attractions like the Eiffel Tower (who would believe it was so unpopular to Parisians in the beginning?) and the Louvre are world-class sights in their own right anyway, but there´s so much else to see to keep you occupied for ages - Notre-Dame cathedral, the Arc de Triomphe and the Champs-Elysées (in my humble opinion the most beautiful street in the world), the Sacré-Coeur and Montmartre, to name just a few. I could be mistaken, but I believe Paris is the most visited city in the world, and it´s easy to understand why. I visited Paris briefly during my honeymoon, because I couldn't call myself a world traveler and skip this Must-See location. Yes, it is all that you think, and yes, it has earned its spot on the list. I love Paris. It's a city that I always find myself coming back to whenever I find myself on the continent for any appreciable amount of time. Whether it be a trip with friends, a romantic getaway with a girlfriend, or simply a solo fling, Paris has never failed to amuse and delight. At the heart of this marvelous city flows the Seine, along whose banks many of the premier tourist attractions and generally amazing sights lie. One can gaze at the wonders of French impressionism at the Musee d'Orsay or cross the river to stroll around the cultural heritage of thousands of years of human history and of hundreds of different cultures at the Louvre. Notre Dame and Sainte-Chappelle stand as testament to the skill and faith of the residents of medieval Paris, while the Eiffel Tower looms large over the city as a symbol of man's ingenuity and technological drive. Still other sights and experiences await along the banks of this remarkable stretch of river for those who have the stamina or the time to explore. If Paris is the embodiment of French achievements of the last two millenia, then the Banks of the Seine are surely its masterpieces. I visited Paris mid Oct 2002 on an official visit from USA and with the little time I had, I decided to explore the banks of the Seine from Eiffel Tower to Notredame. I took the metro train from my hotel to Eiffel Tower and started my stroll along Seine. Weather was perfect and the landmarks both old and new were impressive. No entry fee for the stroll but I took the ascensors up Eiffel Tower for around 7 euros. The shops along the riverbank near the Notredame cathedral adds a quaint character to the walk. Gold Surfaces: Les Invalides. Dome - "6kg of gold leaf"
Modern Urban Planning: Haussmann's wide squares and boulevards influenced late 19th- and 20th-century town planning the world over. Designed by Jules Hardouin-Mansart: Louvre, Les Invalides. Double chapel: Sainte-Chapelle is separated in two parts connected by a staircase : a lower chapel used by the Cité palace inhabitants, and an upper chapel used by the king and his family. Railways: Mus?e d'Orsay is housed in the former railway station, the Gare d'Orsay. Zero Mile or Kilometer Markers: A marker exists at ground level in the square facing the main entrance of Notre Dame Cathedral. Terrorist Attacks: Attentat du RER B à Saint-Michel. 8 fatalities. Places of Execution: Place de la Concorde was the location of the Parisian guillotine during the "Terror". Then called the Place de la Revoultion" - "the guillotine stood in the corner near the H?tel Crillon where the statue of Brest can be found today" (Wiki). Congresses and Conferences: The Paris Peace Conference (1919) to end WWI (The various treaties - Versailles, Saint-Germain, Trianon etc were signed elsewhere as per their titles) was held in the Salon de l'Horloge at the French Foreign Ministry in the Quai d'Orsay. Zero Meridians: Paris was the main "competitor" to the choice of Greenwich at the Conference of Washington. France did not immediately accept the decision of that conference and continued to use the Paris line for some time thereafter. The line is based on the location of the Paris Observatory which is outside the inscribed area, but a line of markers called The Arago Medallions (named after a French astronomer) follows the line across Paris and The Louvre area (within the inscribed boundaries) contains a significant number. Museum History: During the French Revolution (1793), the National Assembly decreed that the Louvre should be used as a museum, to display the nation's masterpieces. King Chulalongkorn of Siam (Rama V): (12-16 Sep) met Felix Faure, visited Eiffel Tower, Louve Museum etc. Hitler was here: Hitler paid a "victory visit" on Jun 23 1942. The "climax" of his visit was to the Tomb of Napoleon! His car had crossed Pont d'Iena and passed the Eiffel Tower/Ecole Militaire. At les Invalides he got out of his car (the only occasion he did!) and walked through the Church and courtyard to be picked up the other side and taken laong the Quai d'Orsay. Giovanni Belzoni: The Louvre Egyptian Collection contains a large number of items collected by Belzoni. e.g the Sarcophagus Box of Ramesses III. Champollion was a curator there and advised Charles X to buy Salt's second collection which the British Museum considered too expensive! Naser ed-Din Shah: "And so we reached the Place de la Concorde, where they have erected a lofty obelisk brought from Egypt." Moved from location of original construction: Obelisk in Place de la Concorde came from Luxor where its twin still "resides". The Tombs of the Kings (Jerusalem) previously housed a number of sarcophagus; they were moved to the Louvre by the French government, who inherited the site after the death of the previous French owner, who had herself purchased the land in 1874. Replicas in Las Vegas: Half size Eiffel Tower at the "Paris Las Vegas Hotel and Casino"
Locations of significant drownings: The Paris "Massacre of 1961" - during the Algerian War somewhere between 40 and 200 pro FLN Algerian demonstrators were driven into the Seine and drowned (some may already have been killed). In 2011 a plaque was unveiled on Pont St Michel stating " De ce pont, et d'autres ponts de la région parisienne, des manifestants algériens furent jetés dans la Seine le 17 octobre 1961, victimes d'une répression aveugle...."
890 Community Members have visited.